I have been using coconut oil for many years now, for both cooking as well as beauty purposes. Have you ever thought about using coconut oil for your baby? Well, after spending some dough on baby products on a regular basis, using coconut oil as a replacement is a good way to save some money. Not only is it a cheaper alternative to the daily products out there, but it's a perfectly natural product that you'd be using. The oil that comes from the fruit of the coconut trtee is known as coconut oil. There's a few different types that you can buy. Virgin coconut oil refers to the type of coconut oil that isn't process, and is refined. Cold pressed is a variant of coconut oil that refers to the process, where the oil has been pressed out of the coconut fruit. Coconut oil has many benefits... it can help cure or improve conditions such as diabetes, heart diseas, thyroid conditions, fatigue, improving immunity, crohn's disease and even irritable bowel syndrome. You can use the oil for many beauty purposes, as a moisturizer and apply it to the skin to reduce sypmtoms of psoriasis or eczema. Diaper rash can affect your little one from as early on as a newborn. If they wear an infant diaper, there's a chance that they will come across it at some point. Even if you take precautions and change their diaper frequently, there's a chance that they can still get a diaper rash. A diaper rash is exactly like what it sounds like... a rash in the baby's groin area. It's usually a red rash that can spread if left untreated. In some cases, it can lead to an infection that can cause pain for your baby. Apply a thin layer of coconut oil to the affected area after each bath time. Slowly and carefully massage the oil in the groin area, and especially in the folds of the skin. With the moisturizing properties of the oil, it will help treat the rash, and the antibacterial properties will prevent any further occurrence of it. Exzema is a skin condition where the skin becomes dry and itchy. It's common in babies, especially since their skin is quite sensitive and can dry out easily. The condition can often go away on it's own, it can be quite uncomfortable and lead to infections if they scratch it. 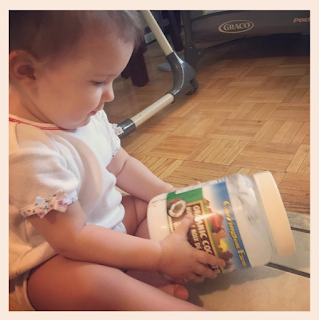 Coconut oil is perfect as a moisturizer, and a good choice for the baby's skin. Massage your baby with the oil before or after bathtime, and at bedtime to help keep the skin hydrated. With a regular coconut oil massage, the eczema will gradually decrease and become treated. This also works for children and adults. This is a condition that affects most newborns, especially after the first few weeks since birth. The condition is characterized by a flaky scalp, similar to dandruff. It's usually located in the areas of where the baby's head would be resting in bed. Since the baby is too young to move it's head, the friction of it's head on the bed can cause cradle cap. It's also known as seborrheic dermatitis or seborrhea. Massage your baby's head with the coconut oil and focus on the affected areas. Let the oil stay on the scalp for some time, and use a baby comb to remove the flakes. You can leave it on the hair to help keep it moisturized, or you can rinse their hair with lukewarm water. When your little one is small, you may find it difficult to find the perfect baby wash. You would probably have no issues finding one that washes them properly, but it's common for the over the counter products to dry their skin. Most of the baby products contain chemicals, that would affect their sensitive skin. It's hard to pinpoint what ingredient that they're having an allergy to. Instead, you could use a homemade coconut baby wash instead... see my recipe below! Combine ingredients in a spray bottle for easy use, shake vigorously, and have fun spraying at bathtime! Once your baby is a few months old, you can start massaging her gums to help with the teething pain, as well as improve the oral hygiene. Just take a small amount of coconut oil on your finger, and gently dab onto your baby's gums. Gently massage in the same way daily, both morning and night. For teething, you can add a little of the oil to her teething toys to help ease the pain... it's antibacterial properties, using coconut oil through your baby's soothers will help ensure that your baby isn't at risk of getting an infection. Coconut oil is an awesome natural cure with many benefits for yourself as well as your baby. Eventhough it's considered safe, be sure to speak to your baby's pediatrician before your baby ingests it. So, try to make sure that you only use it topically, unless your doctor says that your baby can consume it.